Instead of change, women said the new administration only bore all-out war. 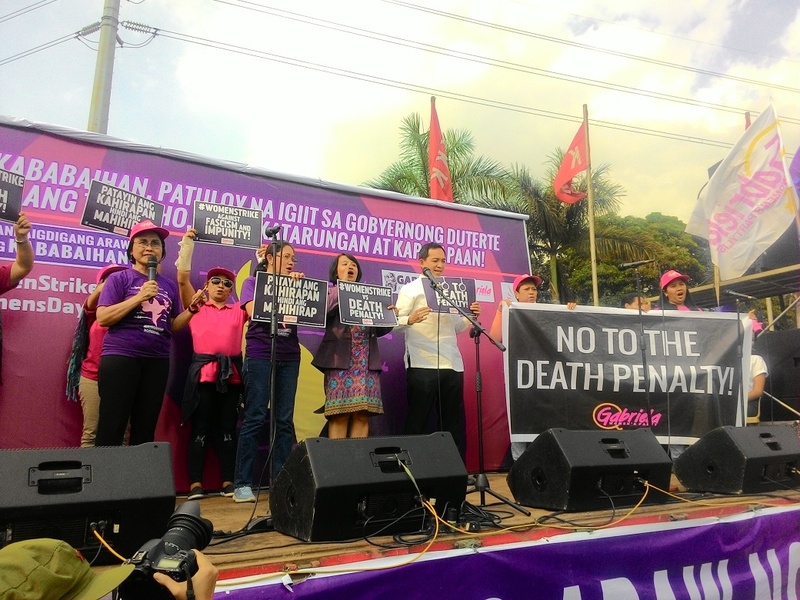 MANILA – March 8 marked the progressive women’s turn to hold President Rodrigo Duterte accountable for all his unfulfilled promises to the Filipino people, foremost of which are land, jobs, justice and peace. 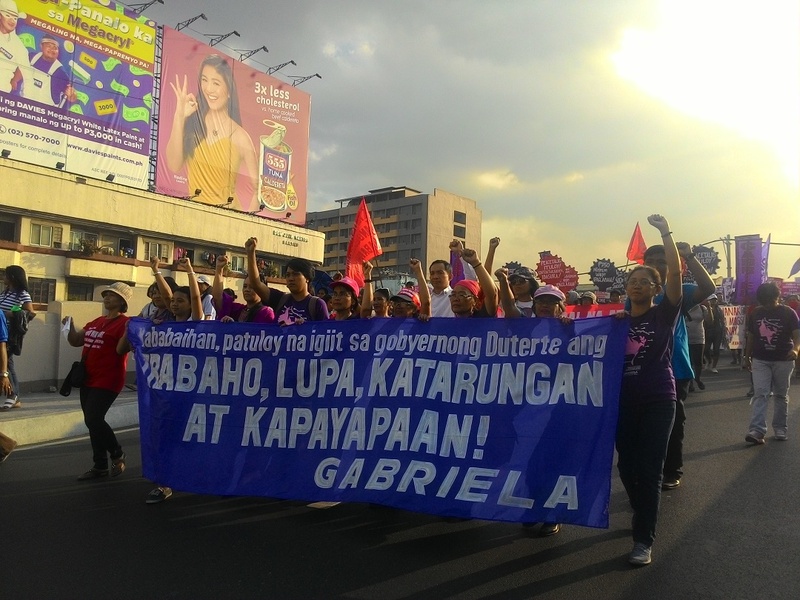 On the commemoration of the International Working Women’s Day, thousands of women led by Gabriela came out to the streets for “a day of reckoning” with Duterte, as they highlight the women’s role in the struggle for change. 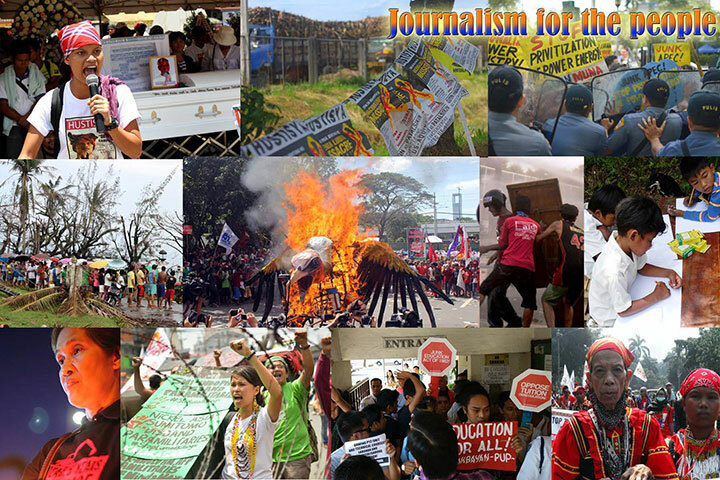 Protesters called on government to address fundamental social and economic problems, and to resume peace talks with the National Democratic Front of the Philippines (NDFP). 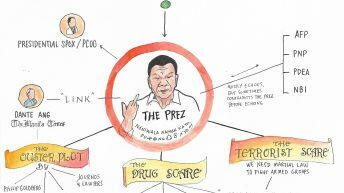 An effigy of Duterte’s iconic fist was portrayed as bloodied, depicting the President’s “failing record” in human rights, with the rampant extrajudicial killings of activists, “on top of massive gangland-style rubouts” of drug suspects. “Kabuwanan na ni Duterte pero patuloy pa rin siyang pabitin, paasa sa mamamayan (It’s Duterte’s ninth month but he has only kept the people hanging), said a Gabriela leader at the program in Mendiola. 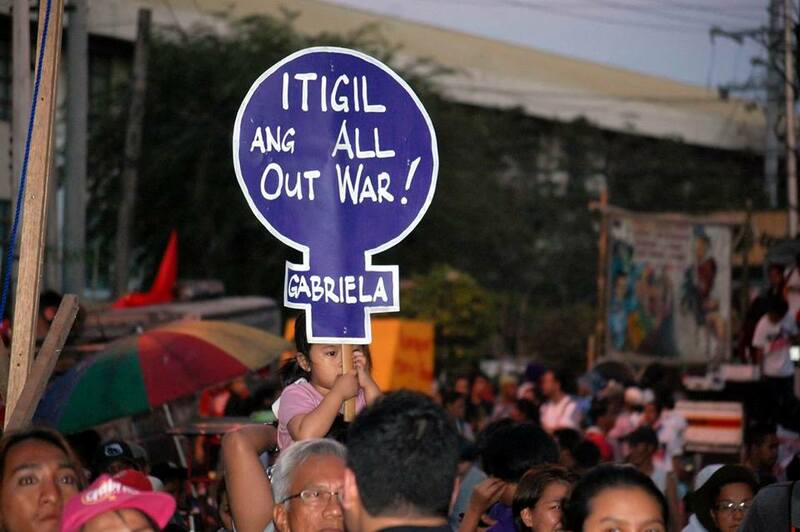 Gabriela compared the Duterte administration to a pregnant woman who should have given birth on the ninth month. But instead of change, they said it only bore all-out war. 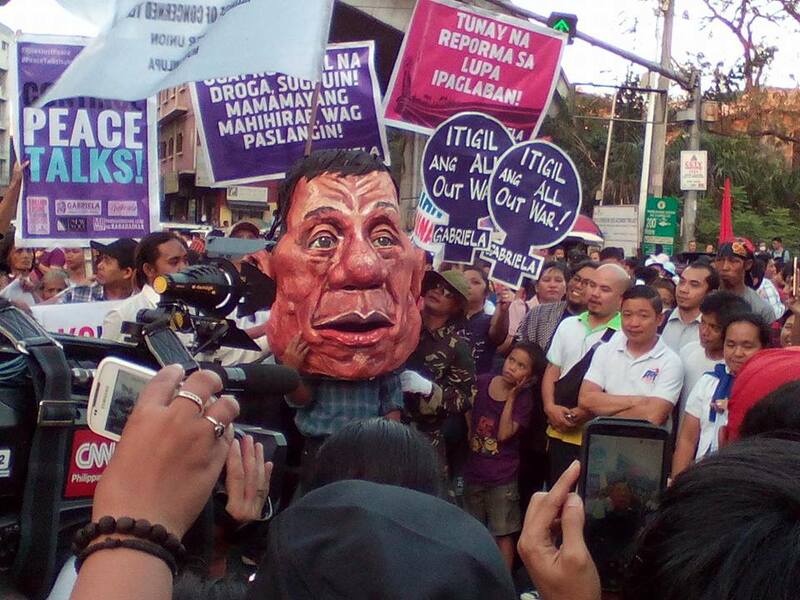 A mascot with an oversized Duterte head dangled a pabitin, a rack of goodies in the traditional Filipino party game which children try to grab as the rack goes up and down. The prizes represented the President’s promises, such as regular jobs, independent foreign policy, and peace — all of which were kept out of the crowd’s reach. Joms Salvador, Gabriela secretary general, criticized Duterte for his failure to make women’s lives better, contrary to his 2016 presidential campaign promises, among which were ending labor contractualization, and land distribution to farmers. She said the liberation of women from tyranny would not be realized if these calls are not heeded. “After nine months of stalling on basic reforms to end job contractualization, broker a peace deal to address the roots of armed conflict, and dismantle foreign military meddling by the United States, Duterte’s constant boasts of being a ‘socialist’ is starting to sound hollow,” said Salvador. She added that a true socialist would prioritize the welfare of workers, peasants and the most oppressed sectors of society. “Duterte, unfortunately, so far shows he is far from that,” Salvador said. 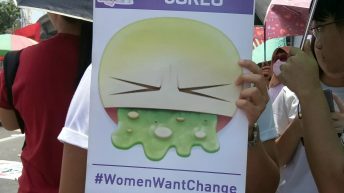 Progressive women’s groups started the day holding separate protests: one in front of the House of Representatives in Quezon City to denounce the railroading of the reinstatement of death penalty, and another at the US Embassy in Manila to slam unfair economic treaties and neoliberal policies. In the afternoon, the groups gathered at the Bonifacio Shrine here, then marched to Mendiola. Among the protesters were members of the Solo Parents Association-Philippines, employees of three government agencies: the Departments of Social Welfare and Development, Environment and Natural Resources, and the National Anti-Poverty Commission. In their main mobilization at the Bonifacio Shrine, women’s groups laid out eight longtime demands which have not been heeded by any administration, past and present. 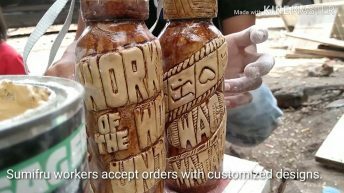 They said women, especially mothers, are burdened by the effects of neoliberal policies, particularly women workers who remain contractual under Duterte. Women also bear the brunt of lack of social services like health because government hospitals get less funds and are being privatized. 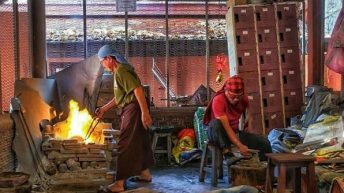 Research group, Center for Women’s Resources (CWR) said that at present, at least 5.4 million Filipino women cannot find decent and regular jobs. Indict former presidents and officials who commit massive human rights violations and plunder of resources. Gabriela Women’s Partylist Rep. Arlene Brosas stressed the need for peace talks to resume, so that both parties may agree to sign the Comprehensive Agreement for Social and Economic Reforms (Caser). Caser will address women’s concerns ranging from social services, social justice, anti-discrimination and elimination of violence against women and children, national sovereignty, genuine agrarian reform and national industrialization, environmental protection, among others. NAPC chairperson Liza Maza spoke at the program and said good news maybe expected in the coming days about the resumption of the GRP-NDFP talks. She said “concrete steps” were discussed when she, Social Welfare secretary Judy Taguiwalo and Agrarian Reform Secretary Rafael Mariano met with Duterte and GRP chief negotiator and Labor secretary Silvestre Bello III. Protesters also lambasted the continued killings of activist and militarization of communities under Duterte. 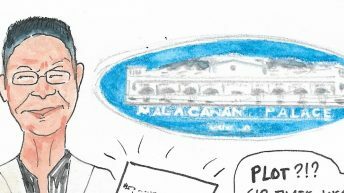 Pya Macliing-Malayao, spokesperson of the alliance of Moro and indigenous peoples Sandugo, lamented how militarized communities have not gotten any relief under the Duterte. She said even her own injury has not completely healed yet the attacks continue. Malayao was wounded in the leg when a police man rammed a mobile into dozens of protesters in front of the US embassy on Oct. 19 last year. 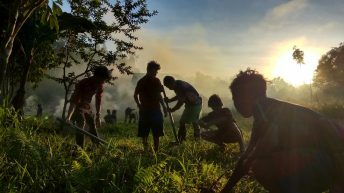 “The grass has barely grown on the graves of more than 100 indigenous peoples killed under the Aquino administration, and yet come renewed attacks,” Malayao said. She said 19 indigenous peoples leaders have been killed by soldiers and paramilitary death squads in the past nine months under Duterte. She said those killed were leaders who stood for the right to land and self-determination, and had opposed the encroachment of destructive mining, logging, dams and plantations in their ancestral territories. She also said that military operations have pushed the forced evacuation of some 1,200 people in Sarangani province in Mindanao, Iloilo province in the Visayas and in Ifugao in Luzon. Protesters scored the impending passage of two laws which supposedly aim to curb criminality, but will only worsen human rights situation in the country: the return of the death penalty and the lowering of the minimum age of criminal responsibility to nine years old. “Can you imagine your child, relative or neighbor being sent to prison at age nine?” said a woman leader of the Unity of Child Rights Advocates against Inhumane Treatment and Neglect of Children (UNCHAIN Children). “Children should be nurtured and given protection… imprisonment will not benefit them,” she said. The group UNCHAIN Children said minors who violate laws are mostly pushed by poverty, peer pressure and domestic violence, and the solution should address these, and not simply “punish children.” Adults are also duty-bound to protect children’s rights and welfare, and government has the biggest duty to provide these. Gabriela commemorated this year’s women’s day also in celebration of the 100th year of the Women’s Day march by Russian women, preceding the October socialist revolution of 1917. Such historic event highlights that a woman’s place is in the struggle, said Salvador. Satirist Mae Paner spoke at the program in Mendiola and said that Filipino people should not be deterred by the many killings under the Duterte administration. “Kung si Duterte ay pumapatay, tayo naman ay bubuhay ng kamalayan dahil tayo ay mag-oorganisa…lalaban tayo (Even as Duterte kills, we, on the other hand will give life to people’s political consciousness because we will organize… We will fight),” she said. GWP Rep. Emmi De Jesus, meanwhile said history of the Philippines would show that women had been at the forefront in the struggle, and one of them is Gabriela Silang. She said the fulfillment of Duterte’s promises will only be attained if the people will continue to demand and fight for it. She said people should continue to assert for the change they want. At the end of the program in Mendiola, a representative of the underground revolutionary women’s group Makibaka, came on the stage and read a solidarity message. It was a first for a women’s day march to have on stage an actual Makibaka representative, who was a petite young woman in a Mao cap, her face painted red and blue. “By joining Makibaka units, women become part of Red chapters and do revolutionary work, up to joining the New People’s Army,” she said. She enjoined the women in the crowd to strengthen the revolutionary movement, and join the people’s war.